Click on the links by each for exercises and activities to work on each skill area. This is a fancy way of saying coordination between the right and left sides of the body. In the grand sense of the term, it means everything that our body does across its midline. This means any signals sent from one side of the brain to the other. It means the two eyes tracking a flying ball together. It means coordinating the muscles on both side of your trunk and neck to twist around and look at something behind you while seated. Likewise, it means using those same muscles in more subtle contractions to keep your balance while you walk and run. It means being able to move your tongue side-to-side in your mouth because the lateral muscles on either side of your tongue work together. In the area of fine motor, people are usually talking about using the two hands together or else about hand dominance when they talk about bilateral integration. However, all of these areas are interrelated, and someone who has significant bilateral integration dysfunction will probably have a cluster of difficult areas such as balance, smooth eye tracking, and coordinated use of both hands together, and possibly language processing delays as well. I have heard that frequent ear infections can be related to bilateral integration problems, and tracheostomies have been linked to poor bilateral integration. For working on hand use, we need to look at hand dominance and whether it has been established pretty firmly. This should happen for tool use by about five and one-half years of age. Indications of developing dominance should be present by three years (reaching and holding more with one than other hand). True ambidexterity is different from difficulties with bilateral integration which have stalled the development of laterality. As an adult, being ambidextrous is interesting and not usually a problem, and about 12% of people are ambidextrous (some say that Einstein was). But when you are first learning to master motor coordination in many different and new tasks, the process is often made more difficult when your brain has to decide each time where to send the commands! Many parents report that their children will do everything with one hand but then write and maybe eat with the other hand. Or they will switch around. If the child's central nervous system hasn't established which hand is the "default" side to send the most-active motor commands to, other factors will help it make that decision for each task. For example, kids who switch back and forth may be reaching with whichever hand is on the side of the target, and will then just use that hand to manipulate the object rather than shift it to the other hand. Or they may be using the side that has the stronger eye if their two eyes aren't working together well. So they will do large movements (throw, reach, touch) with one side (the slightly more dominant hand) but then write and do tasks that require careful close looking with the other hand (if the opposite eye is working better for them). Then we need to look at using two hands together smoothly. First, children learn to use two hands together for a symmetrical activity. Think of a toddler banging pot lids together. Then they learn to hold one hand still while the other works, and finally to use both hands simultaneously for different movements. This is what is necessary to turn a paper with one hand while cutting out a circle with the other. Add in all kinds of fancy motor planning and you have playing a musical instrument. For activities to work on bilateral integration, click here. 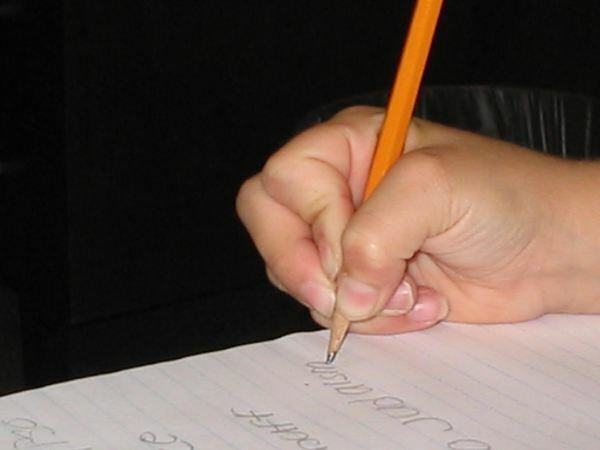 Believe it or not, problems with handwriting can stem from problems with seated posture and shoulder positioning. Think of your body for a moment as a robot whose job is to etch small marks into a specific area. If your robot arm is attached to a wobbly, unbalanced, or weak base, how can it be in just the right place and use just the right small movements to do its job? The same is true of a student sitting and writing. If he lacks the muscle strength to hold himself upright in a chair (or has sensory processing or attentional issues that prevent him from sitting for more than a few moments at a time), his ability to place and control his hand and fingers will be compromised. Usually muscle tone and/or strength issues are seen in conjunction with poor postural stability, and these are usually seen throughout the body, so that poor posture is rarely an isolated cause of handwriting problems. However, even with strengthening and skill building within the hand, if postural and shoulder stability deficits are not addressed, increases in functional fine motor skills will be difficult. For exercises to work on postural and shoulder stability, click here. The same applies to holding and using a pencil or any other fine motor tool. Strengthening the wrist extensor muscles, which run all the way across the wrist from the back of the hand and the wrist bones themselves to the elbow, can be an important step for working on fine motor skills. For exercises to work on wrist stability, click here. There are two transverse arches, four longitudinal arches, and four diagonal or oblique arches of opposition in your hands. These arches shape the hand to grasp differently-shaped objects, direct the skilled movements of the fingers, and grade the power of grasps. All skilled movements within the hands work off of these arches. For a tour, cup your hands as if you are going to scoop up water. Now pinch your thumb and pinky together. Take a moment to marvel at all the positions your thumb can reach across your palm and fingers. Some small amount of palmar arch development is present at birth, but most of it takes place as we develop in our first few years. When we weight-bear on our palms (crawling and scooting), we strengthen the muscles that pull the pinky side of our hand up into an arch. Children who didn't spend much time crawling often need some extra work on their hand arches. Those pinky-side muscles, the muscles running from the base of our thumbs, from bone to bone in the hand, and at the base of each finger continue to strengthen as we begin to grasp onto large (stuffed animal) and then later small (cheerios) objects. By Kindergarten, these arches should be pretty well-developed and ready to work with large-diameter writing tools. I test these arches by asking children to cup their hands and shake dice, to "make spiders" on a table with their fingers, and to move their pinky and thumb together and apart several times. I look for the depth of the "bowl" in the palm and for movement at the base of the pinky to pull it up into opposition to thumb. There should also be wrinkling of the muscles along the pinky-side of the palm as the muscles there contract. For exercises to work on developing the arches of the hands, click here. For effective manipulation within the hand, the thumb must move into full abduction with rotation inward so that thumbtip can touch any fingertip. From this position, a triad of thumb muscles, those most densely supplied with sensory receptors to provide feedback to our brains, will guide movements and regulate pressure for speed and dexterity. This is the position that is facilitated by wrist extension. Many children (it seems like about 25-50% to me when I walk into any first grade classroom) don't have good stability and strength through these three muscles and the base of the thumb. They often substitute one larger muscle that pulls the thumb in against the side of the index finger, closing the thumb-index webspace. When holding a pencil, this substitution means a pinched-in thumb position rather one with a round webspace and the thumbtip on the pencil. It could be a thumbwrap, a thumbtuck, or another ineffective grasp. Often, these pinched-in grasps will mean heavy pressure of pencil against paper, quickly fatiguing hands, and difficulty keeping their pencils or coloring tools where they want the marks on the paper. I measure stability of thumb webspace by having children do a few pinching-type tasks (close a Ziploc bag, squish a ball of putty into a pancake) and by having them form the "OK" sign with thumb and index while I try to pull it apart with my two hooked pinkies. I also watch how they hold a pencil with and without pencil grippers while writing. For exercises to work on improving thumb opposition and webspace, click here. Refinement of skill with the radial (thumb-index) side of the hand is best achieved when the ulnar (pinky) side of the hand is stabilized. When pinky and ring finger are still -- either curled into the palm or are stretched out into extension away from the other fingers -- we are best able to control our middle and index fingers and thumb for precise motions. Try it now: pretend to thread a needle and look at your pinky and ring finger on your active hand. Pretend to wind a small knob, such as on a watch, and check again. They should not be moving along with your index and thumb. This separation offers the most stability through the hand while allowing free movement of the digits which are working on the fine motor task. Early separation of the two sides of the hand is sometimes present at birth. It develops when an infant crawls and bears weight on the pinky side of the hand while carrying toys with the thumb and index side. A different nerve controls some of the muscles of the pinky and ring fingers from the index, middle, and thumb digits, and with experience we learn to inhibit movements of ring and pinky while the other digits are working. There is a little ligamentous link between the tendon of the middle and ring fingers which make it more challenging to extend our ring finger without moving the middle finger. Therefore, some slight connected movements are often seen between these two fingers, but effective separation can occur even so. When writing, this separation is important because it allows us to stabilize the side of our hand and pinky against the page so that we can slide along and keep our writing on the line without much effort. Try writing on a line while not allowing your hand to touch the paper. Cutting with scissors requires separation of the two sides of the cutting hand for precision in steering while opening and closing the scissors. To assess this in a child, I watch for automatic separation of function (curling in or stretching out pinky and ring fingers) while cutting, snapping, threading a large needle, moving pegs, and flipping pennies over. Spinning a top and winding a toy are amongst the other activities where this separation should be observed. For exercises to work on separating function of the two sides of the hand, click here. This refers to the ability to shift objects about with the fingers of one or both hands, such as to examine an object by touch or vision, or to get something oriented just so, or to position something for the best grasp. This depends on mobility and coordinated control at the base joints of your fingers (called metacarpal or MP joints), which allow for thumb-finger oppositions in different positions. Children who are lacking these higher-level developmental fine motor skills often appear "fumbly" when trying to use their fingers to maneuver small objects. They may use two hands for a task that we would consider a one-handed task, or they may set down an object to pick it up a different way rather than shifting it within the hand. There are many different such movements possible, and they have been termed differently by different people. The terminology that I use is based on a combination of that used by two well-known occupational therapists who have each written extensively on developmental fine motor skills, Mary Benbow and Charlotte Exner. Here is a breakdown. Rotation is the act of turning something (of course), but there several types. Simple rotation can be seen when you pick up a pencil that is oriented across your body and then flip it about in your hand so that it is in the writing position. If you try this, you'll see that one way is simpler than the other, depending on whether the point of the pencil is facing to the right or to the left. Precision rotation involves turning something in the fingertips, such as rotating a coin to read the words around the edge or to flip a coin over and over in the fingertips. Finally, there is a lateral shift movement of the thumb against fingers such as to wind up a small toy, that some people call rotation. Translation is the movement of objects between palm and fingertips, such as selecting one coin from several in your palm and moving it to the fingertips with only one hand active. Also referred to as squirreling (to palm) and de-squirreling (to fingertips) small items. Shift is the balanced movement with opposed thumb and finger such as to thread a needle, push a button through a hole, pick a small bit of lint off of fabric, or poke a pin into a pincushion. For exercises to work on in-hand manipulation skills, click here. There are over 25 muscles of each hand. Overall weakness of these muscles can be an issue in fine motor skill development. Often some muscles are notably weaker than is typical and this makes certain types of grips or movements more difficult than others. Keep in mind, though, that the higher-level manipulation skills require a good balance of strength and stability throughout the hand so that any area of weakness will impact them. Often, children have over-strengthened some muscles because of substituting those muscles for less-developed muscles. This is seen frequently in the muscles that attach at the base of the thumb that allow for positioning in opposition and skilled movement there. Rather than using the more skilled triad of thumb opposition muscles, children will substitute one larger but less skilled adduction/flexion muscle. Also, the extensor muscles of the hand develop later than the flexor muscles, and often strength issues are more notable in extension. For example, lifting each finger up from a "spider" position on a table is often more difficult than curling each finger up from a palm-up position. For exercises to work on overall hand and finger strength, click here. Here is a link to an exerpt from a book chapter that discusses the development of various grasp patterns, definitions of different grasps, and at what ages different authors found that these grasps develop. It is really designed for OTs and others who would be studying child fine motor development. But if you scroll down there are some really nice pictures of different grasp patters and these help to illustrate some of the aspects of fine motor discussed above.